Ben Dickey steps to the plate. The junior outfielder and the Wildcats turned in a typically inconsistent weekend against No. 23 Texas. 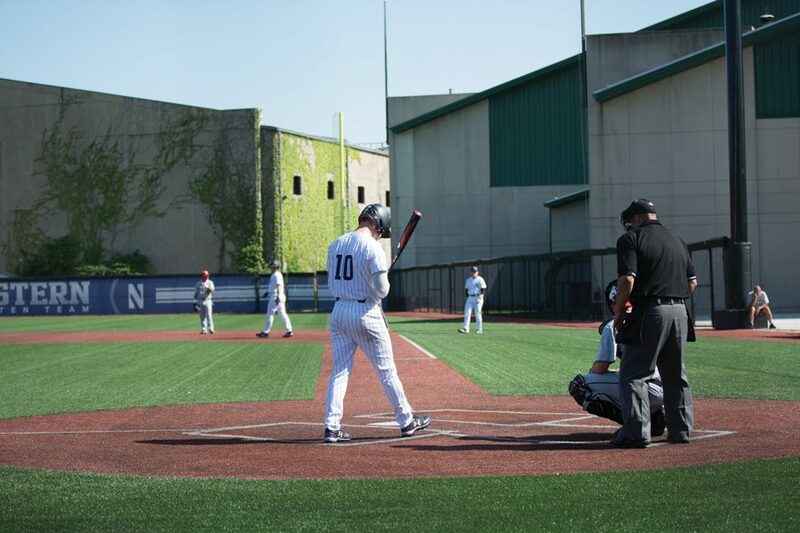 Northwestern lacked consistency this weekend after a strong start deteriorated into blowout losses Saturday and Sunday, once again demonstrating the need for decent pitching from the team’s starters. The Wildcats (3-7) dropped three of four games to No. 23 Texas (8-4), but freshman pitcher Quinn Lavelle clocked in yet another win with a strong Friday performance in the series opener. Lavelle allowed only one earned run during a 4.1-inning outing to lead NU to a 6-2 win. Lavelle’s ability to control his off-speed pitches, coach Spencer Allen said, explains the win and his 3.21 ERA in 14 innings this season. Freshman outfielder David Dunn backed Lavelle’s defense by hitting a perfect 4-for-4 with two RBIs and a run scored. Dunn’s second-inning single set up an early lead, and his run in the fifth gave the Cats insurance. Junior infielder Jack Dunn crushed a home run to the Cats’ bullpen to follow in the sixth. His approach, he said, wasn’t any different than other at bats. Friday’s win would be the only one in the series, leaving the Cats scrambling for a chance despite a lack of strong pitching. The Longhorns gained early leads in both games of Saturday’s doubleheader, defeating the Cats 10-7 and 16-3 respectively. Though NU competed offensively during game one, a poor start by freshman pitcher Ryan Bader and a lack of early runs hurt the Cats. The same obstacles plagued the Cats on Sunday as short performances failed to contain the Longhorns’ bats. And though the elder Dunn reached base five times over the weekend, his walk resulted in NU’s only run in Sunday’s 12-1 loss. The series wasn’t completely devastating, however, as No. 23 Texas was one of NU’s toughest challenges this season. Friday’s impressive outing showed that the Cats could compete with a team that is historically one of the nation’s best. If the Cats are able to generate quality starts and confident, productive at bats, then Northwestern may once again have another chance at a deep run in the Big Ten Tournament. Addressing short performances and long innings are key to solidifying NU’s performance, as even Lavelle lasted only 4.1 innings on Friday. Moving forward, Northwestern will hope for strong, consistent starts from its pitchers, Allen said.